It’s been clear from the start, though, that the Healbe is no ordinary hustle and CEO Artem Shipitsyn no ordinary hustler. And so, while reporting each new twist, I’ve also been trying to look backwards -- to understand the whole story of how Shipitsyn’s ‘miracle’ wristband reached the point where it was able to attract over a million dollars in donations and humiliate one of the largest crowdfunding platforms on the Internet. In 1999, according to Healbe’s Indiegogo page, scientists at a St. Petersburg-based company called Algorithm began working on a technology to monitor human glucose levels non-invasively -- that is, without drawing blood. This is something that doctor after doctor has described to me as the “holy grail” of medical technologies for the world’s 380 million diabetics. And it’s a problem medical laboratories have been trying to solve since 1975, with no good solution yet. Whichever version of events is true, we know that Algorithm wasn’t in a hurry to do anything with its medical breakthrough, nor was it keen to publish any test results. Instead, in 2003, Algorithm joined forces with Boston-based Gen3 Partners to provide outsourced R&D facilities as Gen3’s official ‘Global Innovation Center’. Since then it doesn't seem to have been actively involved in developing its non-invasive glucose tester. Still, Algorithm’s research remained unexploited until May 2012 when Artem Shipitsyn appeared on the scene. Shipitsyn was an owner of a marketing agency called Iridium and, according to one media profile, in 2010 was briefly the proprietor of a cake shop that went bankrupt. One Russian newspaper reported that Shipitsyn and his partners had spent five years trying to get funding to buy Algorithm’s technology. According to one of those partners, Yevgeny Sokolov, they ultimately paid less than 10m rubles ($280,000 USD) for the intellectual property. The ongoing relationship between Algorithm and Healbe is another murky aspect of the story. Healbe began applying for its patents in August 2013. To date it has three Russian patents that we know of: “A Method of Human Blood Glucose Concentration Measurement,” “Sensor for Measuring Impedance of a Human Body Area,” and "Method for Measuring Human Organism’s Calorie Intake during a Meal." According to an interview with Shipitsyn in a Russian business magazine, published in late March 2014, Healbe quickly raised six million rubles from Alexei Jilin, the Managing Director of Starta Capital in Moscow, equivalent to roughly $170,000 USD. This was apparently enough to get Jilin a 20 percent stake in Healbe, another bargain price for a technology with such massive global potential. By May 2013, Shipitsyn and Healbe had produced a run of 45 bands that he told the reporter worked poorly, were fragile and inconvenient to wear. Shipitsyn told one journalist that, following that disastrous early run, Starta Capital invested another three million rubles and that another investor, Dmitry Chaly had put in seven million. This would put total investment at $450,000 USD. In early 2014, before the Indiegogo campaign started, Shipitsyn was quoted as saying that Healbe had $2.1 million invested. Later, as the Indiegogo campaign approached $900,000, he would revise that investment number up to $3 million. Shipitsyn has said that Healbe needs $6 million (or $6.5 million depending on which of his estimates you take from which article) to begin production in China. It’s unclear where, if anywhere, Shipitsyn has found the additional money. In one profile in early April, he spoke about crowdfunding as only being a good option for companies struggling for venture capital and that Healbe began its campaign with little money. Brain Blanchette, MicroArts President, said, “We’re excited about the role MicroArts played in helping Healbe introduce GoBe to the world on Indiegogo.” He added, “It was a complete collaborative effort between MicroArts, the Healbe Corporation, and the team from Levin Consulting that’s resulted in the success GoBe is having on Indiegogo. In January of 2014, Shipitsyn flew to the US to visit MicroArts’ office, where he recorded the video which would later be used on Healbe’s Indiegogo page. He then traveled to the Consumer Electronics Show (CES) in Las Vegas, where Healbe shared Ohio-based distributor Levin Consulting’s booth with 16 other companies. 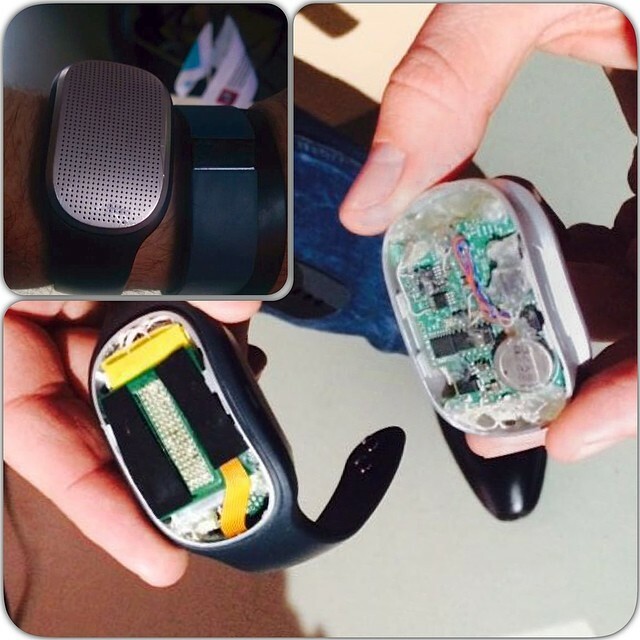 On March 20th, Pando published my first article about Healbe and the GoBe device. At that point the device had raised over $700k in a little over two weeks. Before publication, an Indiegogo spokesperson told me that, “We have no reason to believe that this company’s Indiegogo campaign is at all fraudulent.” The site’s help center guaranteed to catch “any and all” cases of fraud on its platform. By that point, though, there were plenty of reasons to believe Indiegogo was hosting a fraudulent campaign: Medical experts I consulted for the story hooted with laughter when I shared Healbe’s claims, at least until I told them how much money users had already pledged. Other red flags included the fact that Healbe had made no mention of being based in Moscow, instead listing San Francisco as its base of operations. As far as I’m able to tell, Healbe's entire US operation is limited to the offices of MicroArts in New Hampshire and its lawyer’s office in Redwood City which it lists as its mailing address. Shortly after the story was published, an Indiegogo rep called me, furious because I’d written that the company had detected no “red flags” with Healbe's campaign. After a full day of back and forth between Indiegogo reps, marketing head Shannon Swallow confirmed that the campaign had been examined and passed the site’s fraud checks. “If you’re a legitimate company, you’re aware of the research,” Robinson says. On March 31st, asked about the lack of research, MicroArts’ Meghan Donovan responded with a statement that: “Healbe has conducted internal testing on GoBe and is in the process of securing third-party testing to officially validate the product’s claims and accuracy. We will be posting more information on our patents and investors in the future.” The company would also be adding in an FAQ to more specifically describe how it automatically tracked calories later that week, she added. The release of the video marked the beginning of a PR offensive, coordinated by MicroArts’ founder, Brian Blanchette. Healbe produced its medical expert, Dr. Vladimir Leonidovich Emmanuel, and a short research paper. 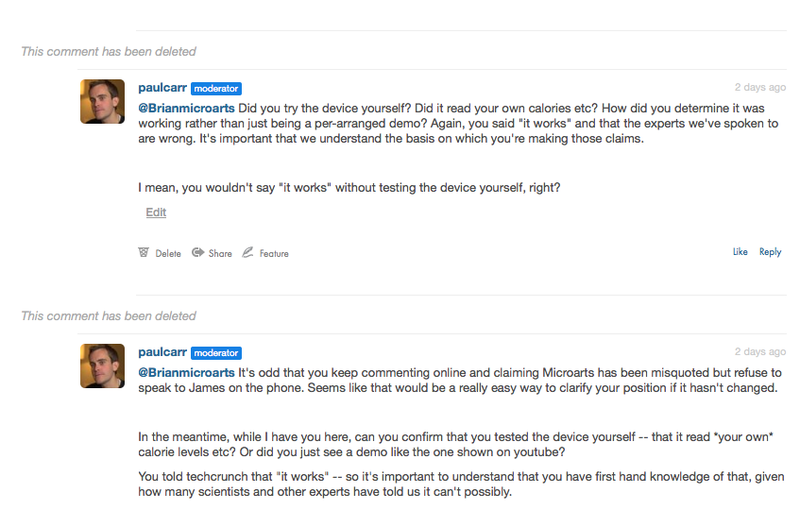 Blanchette also began commenting on the various Pando articles about Healbe, attacking my reporting, accusing Pando of misrepresenting MicroArts' (on the record) statements and insisting, repeatedly, that the Healbe functions as claimed. When invited by my editor, Paul Carr, to speak directly to Pando in order to correct any alleged inaccuracies, Blanchette responded "If I wanted to do an interview with Pando I would have, I don't." Blanchette subsequently erased all of his comments. In on of those subsequently deleted comments, Blanchette accused Pando of picking and choosing which experts we consulted, and ignoring the “proof” provided by Dr. Emmanuel. Blanchette was wrong -- I had exchanged several emails with Dr Emmanuel, who showed no hesitation in answering my questions. “Widespread use of the device will determine the limits of its informativeness, identify constraints and calculate risks,” Dr. Emmanuel wrote to me. In other words: we won't really know how well GoBe works until people start using it. Every time Healbe released new scientific claims, I shared them with a new round of scientists and experts. The response to the company’s “research paper” was emphatic. UCLA’s Dr. Peter Butler - an endocrinologist with more than three decades of medical experience in patient care and diabetes research - said simply that Healbe’s workings lacked any credibility and did not make scientific sense. "People who struggle with weight loss will believe in anything. You're making sales on the back of desperate hopes." “That they didn’t go that route speaks volumes as to their ability to convince scientists of their device’s abilities and the science behind it,” Freedhoff said. "To me it seems like you're trying to focus on a group of people more likely to believe in this. People who struggle with weight loss will believe in anything. You're making sales on the back of desperate hopes." Meanwhile, my quest to get hold of a GoBe -- or at least find someone who had actually tested the thing -- continued. In one surreal exchange in Pando’s comment section, someone apparently connected with Healbe offered to fly me to St Petersburg to see their research lab (presumably he was referring to Algorithm’s lab) for myself. My editor responded that Pando would be glad to fly me to Russia at our own expense, but only if Healbe allowed us to bring an independent expert to text the device. The company did not respond. ...on April 3rd it quietly deleted the anti-fraud guarantee from its website. On April 10th, Healbe finally pushed past $1m in donations. As I reported earlier this week, the donation which pushed Healbe over its $1m threshold was made by Kate Drane, Indiegogo’s own head of hardware. Pando confirmed with several other Indiegogo fundraisers that Drane frequently plays an active role in recruiting new campaigns to the site, undermining the company’s claim to simply be an impartial platform. As to the second issue about the feasibility or quality of delivery, we know that potential contributors are best served when they get educated, know the facts and can therefore make informed decisions. Further throwing its lot in with Healbe, Indiegogo’s marketing and communications head Shannon Swallow took to the comments section on the Healbe page, thanking customers for their support and linking to Rubin’s statement. Absent some dramatic pledge by Indiegogo to make good any future refund claims, or Paypal invoking its own anti-fraud policy, all Healbe's thousands of backers can do now is wait and hope: Wait for the GoBe device to be delivered, and hope that, despite all medical evidence to the contrary, it will work as advertised. According to his most recent posting on Indiegogo, Shipitsyn is currently in China overseeing the device’s manufacturing, ahead of a promised July delivery date. See here for the latest updates on this story.